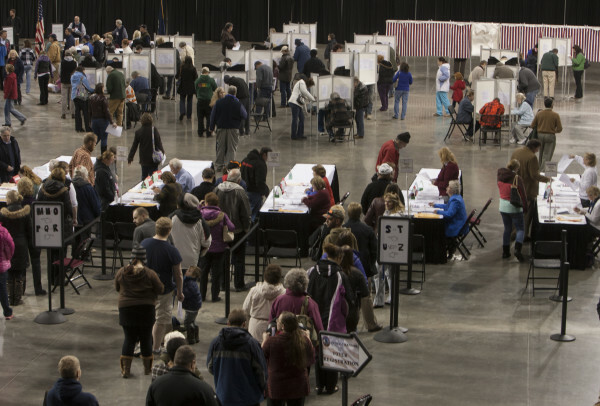 Bangor residents cast their votes at the Cross Insurance Center in Bangor Tuesday during Election Day. Former House Speaker John Martin, D-Eagle Lake, lost two years ago during a Democratic sweep. Two years later, during a GOP sweep, it appears that Martin has triumphed over Republican Allen Michael Nadeau. The following Democratic incumbents have lost: Wayne Werts of Auburn, Brian Jones of Freedom, Lisa Villa of Harrison and Katherine Cassidy of Lubec. Republican Beth O’Connor is leading Democratic Rep. Joshua Plante in the southern Maine district she represented from 2010 to 2012. Rep. Larry Lockman, R-Amherst, a target for Democrats, appears to have won re-election 57-43. The Democrats have lost the seat held by their majority leader, Seth Berry. Republican Brian Hobart will represent the Richmond-Bowdoinham area. The Democrats did oust Republican incumbent Sharri MacDonald of Old Orchard Beach. She has lost to Democrat George Hogan after serving one term in the House. In Knox County, where redistricting pitted two incumbents against each other, independent Jeff Evangelos of Friendship appears to have narrowly defeated Republican Rep. Ellen Winchenbach of Waldoboro. Our tally now shows Republicans leading in or winning 18 Senate seats; Democrats lead in or have won 17. If the results hold, Republicans will reclaim control of the state Senate, but potentially without their current leader. Sen. Eloise Vitelli, D-Arrowsic, who won a special election last summer to replace state Sen. Seth Goodall, is trailing Republican Linda Baker. In that race, Green Independent Alice Knapp so far has about 12 percent of the vote with seven of 11 precincts reporting results. The Blaine House will stay Republican, the 2nd District will go red, too. But what about the state Legislature? The Senate is a real possibility, according to the BDN’s latest tallies. The one certainty is the 35-member chamber will be closely divided. The latest tally has Democrats leading in or winning 18 Senate races and Republicans leading in or winning 17. First-term Democratic Sen. Jim Boyle of Gorham has lost to Republican state Rep. Amy Volk of Scarborough. It appears as if state Sen. Colleen Lachowicz, D-Waterville, met the same fate. In Aroostook County, the race between Republican Peter Edgecomb, a former state representative, and Democratic Rep. Charles Theriault has tightened. Edgecomb has the lead at the moment, 51-49. Sen. Brian Langley, R-Ellsworth, was targeted by Democrats, but it looks as if he’ll win by a safe margin. Democratic state Sen. John Cleveland, D-Auburn, will lose his seat — which often flips between the parties — to Republican Eric Brakey. Brakey won the seat 59-41. In a rare bright spot for Democrats, it looks as if the Republican’s Senate leader could be in trouble. Sen. Mike Thibodeau, R-Winterport, has been trailing his Democratic challenger, Jonathan Fulford, all night. In York County, Democrat and former state Rep. Gary Connor has a lead over Republican incumbent Sen. Ronald Collins, though half of that district’s precincts have yet to report results. Also in York County, longtime Democratic legislator John Tuttle of Sanford is trailing Republican challenger David Woodsome. Woodsome leads the incumbent 59-41. No, Gov. LePage doesn’t technically have a say in who serves as attorney general. But lest people laugh off Gov. LePage’s suggestion that independent Eliot Cutler serve as the state’s top lawyer, remember in 2010 that LePage suggested Bruce Poliquin — now the likely victor for Maine’s 2nd District seat in Congress — serve as state treasurer. The then-Republican Legislature abided. It remains to be seen how a more Democratic legislature reacts to this suggestion — especially given the resentment many Democrats undoubtedly feel toward Cutler. With LePage’s re-election, along with the fact that gubernatorial races in Massachusetts and Connecticut could go Republicans’ way, New England could have three GOP governors come January in a region where LePage is currently the only Republican governor. That could have some meaningful policy implications for Maine and the rest of the region. Massachusetts’ current governor, Deval Patrick, faced criticism from LePage over the summer for backing out of a regional agreement to pay for the construction of new natural gas pipeline capacity through a surcharge on the region’s electric rates. Republican Charlie Baker, Patrick’s likely replacement, hasn’t taken a position on the pipeline in question — which would be built by Kinder Morgan and stretch through much of western Massachusetts — but he’s more open to natural gas expansion than the Democratic incumbent, who is termed out. As votes pour in and LePage is the likely winner, it’s perhaps surprising that the Michaud campaign and outside groups supporting the Democrat spent about $10.1 million in the election, compared with $5.7 million spent by the LePage campaign and groups supporting him. That doesn’t include some spending in the last days of the campaign, but reflects the bulk of campaign spending up through last week and outside spending through Monday. Florida Gov. Rick Scott has defeated Democrat Charlie Crist. Wisconsin Gov. Scott Walker has defeated Democrat Mary Burke. In Kansas, Republican incumbent Sam Brownback holds a slight lead, though it’s close. One unpopular Republican governor did lose re-election: In Pennsylvania, Tom Corbett has lost to Democrat Tom Wolf. The results in Alaska, where Republican Gov. Sean Parnell had a tough battle to keep his job, won’t be out until, likely, well after the polls close at 12 a.m. Eastern Standard Time. Gov. Paul LePage took both of the Twin Cities, getting about 51 percent of the vote in Auburn, where he took 4,960 votes. Democrat Mike Michaud garnered about 39.6 percent of that city’s vote, with 8.5 percent. In both Auburn and Lewiston, his hometown, LePage captured significantly more votes in his hometown than he did four years ago. He captured 6,846 votes in Lewiston this year, compared with 4,626 in 2010, when he also won the city. In Auburn, he won 4,960 votes compared with 3,452 in 2010. In keeping with tradition, the results for state Senate in Lincoln County are running close. With six of 20 precincts reporting, Democrat Chris Johnson, the incumbent, is leading Republican Les Fossel by just four votes, according to the BDN tally. If the results remain this close, Fossel could be in for his fourth recount for a legislative seat in 12 years. Another tidbit from Lewiston worth noting: The Democrats have managed to hang onto the state Senate seat representing Maine’s second largest city. Nathan Libby edged out Patricia Gagne 6,636-6,572. The Republicans had some hopes of capturing this Democratic seat, and they lost it by fewer than 100 votes. BDN columnist Matt Gagnon earlier today identified nine Maine towns that have voted with the winner of Maine’s last six gubernatorial races. We have results from one: Hammond, in Aroostook County. LePage captured it, but not by much: 20 votes to 19 votes for Michaud, four for Cutler. If Hammond is an indicator of where this race is headed, it’s a close one. Lewiston’s results are in, and LePage has captured significantly more votes in his hometown than he did four years ago. He captured 6,846 votes this year, compared with 4,626 in 2010, when he also won the city. At the same time, Democrat Cain bested Republican Poliquin: 6,439-5,212. Independent Richardson captured 1,462 votes. Other interesting notes from Lewiston: Voters favored a bear baiting ban 6,907-6,396, but not legalizing recreational marijuana — 7,366 “no” votes to 6,044 “yes” votes. The Upshot from The New York Times put together a rundown earlier today of the effect governors’ races across the country could have on Medicaid expansion. Maine, of course, tops the list. But there are a number of other states where competitive gubernatorial races could mean reversals on Medicaid expansion. Among those states that could shift from “no” to “yes” if Democrats or independents win are Alaska, Florida, Kansas, Pennsylvania and Wisconsin. Of the six bond questions on the ballot, all are passing so far — by the BDN’s tally — save for Question 5, a $3 million bond issue for expanded biotechnology training at MDI Biological Laboratory. It’s worth noting the “yes” votes are running ahead in Hancock County, where the lab is located. Perhaps a sign of how some results will shake out tonight. The BDN has Biddeford’s results, and the city has gone for Mike Michaud, but not by much: 47 percent for the Democrat, 44 LePage and 10 percent Cutler. Four years ago, the city went for Cutler, giving the independent 34 percent of the vote to LePage’s 28 and Libby Mitchell’s 25 percent. Biddeford voters have come out in favor of a ban on bear baiting, hounding and trapping: 52-48. And for a sense of where outside groups — PACs and party committees — have focused most of their attention, check out an overview of their spending in each district below. While it’s too early to call control of the U.S. Senate, Collins will return to a Senate that’s already more strongly Republican than the one she’s leaving. In West Virginia, Republican Shelley Moore Capito has captured the seat of retiring Democratic Sen. Jay Rockefeller. A number of Collins’ Republican colleagues have also cruised to easy re-election victories, including Oklahoma Sen. James Inhofe, Mississippi Sen. Thad Cochran (whose true challenge was in the GOP primary), Alabama Sen. Jeff Sessions, South Carolina Sen. Lindsey Graham and Tennessee Sen. Lamar Alexander. The Republicans in the Senate, of course, will be led by Mitch McConnell, who won re-election in Kentucky. The big question for him is whether he’ll be able to call himself majority leader. Polls have closed, but if you were in line before 8 p.m., you’re allowed to still cast a ballot. In some spots (Hampden, we’re thinking of you) the lines are still quite lengthy. AP and CNN have called Maine’s U.S. Senate race for incumbent Susan Collins. Another six years. With polls set to close, it’s worth taking a look at how outside spending has impacted legislative races in this year’s election. Two years ago, third-party groups — that is, not the candidates and the campaigns they control — sunk more than $3.5 million into the battle for control of the Legislature. That level of spending set a record and trounced the record set in the previous election cycle, 2010, when outside groups spent about $1.5 million. Some 70 percent of it went into 10 key Senate races and 10 key House races. The final figures aren’t in for this election cycle, but the outside spending in legislative races appears to be significantly lower than it was two years ago. About a week ago, spending on legislative races was at about $1.6 million. Democrats and allied groups had spent 73 percent of that total, the majority to oppose Republican candidates. Welcome to the BDN’s election night live blog on The Point. We’ll chime in throughout the night with insight and observations as results from across the state start to trickle in and the candidates react. Some 581,000 Maine residents cast ballots in the race for governor in 2010. Will we surpass that number tonight, and who will benefit from a higher turnout? Maine Secretary of State Matt Dunlap on Monday told the BDN he projected turnout between 55 and 60 percent, compared with the 50-55 percent turnout that’s typical for a midterm election year. He expected a higher turnout especially in the 2nd Congressional District, which features the hotly contested U.S. House race with Democrat Emily Cain, Republican Bruce Poliquin and independent Blaine Richardson. There’s also Question 1, the referendum on bear baiting, hounding and trapping to consider. That’s an issue that can motivate voters, especially in the more heavily bear-populated 2nd District. With all the attention on the gubernatorial race, control of Congress and bear baiting, it’s also easy to overlook the battle for control of the Maine Legislature. Control of the 35-member Maine Senate is potentially in reach for the Republicans. Both parties have battled fiercely in some select districts, and Democrats have spent heavily to defend their turf. Will the Democrats’ spending advantage be enough to defend their control of the House and Senate.